The 2014 NFL playoffs will open up with the traditional Wild Card Weekend, which features four games between Saturday and Sunday. The playoffs will kick-off when the Kansas City Chiefs clash with the Colts in Indianapolis. Andy Reid was able to lead the Chiefs to an 11-5 record and a Wild Card berth in his first season in Kansas City. Andrew Luck and the Colts captured the AFC South crown after also going 11-5. Luck has reached the postseason in each of his first two seasons. In the other AFC matchup, the San Diego Chargers will square off with the Bengals in Cincinnati on Sunday. The 9-7 Chargers clinched the final playoff spot in the AFC on the final day of the season. The Chargers outlasted the Chiefs in overtime in Week 17 to grab the last Wild Card berth. The Bengals rolled to the AFC North title after going 11-5. The Bengals are in the playoffs for the third straight year. The top two teams in the AFC earned Wild Card weekend off. Both Peyton Manning and the Denver Broncos and Tom Brady and the New England Patriots secured first-round byes. Manning’s record-breaking season led the Broncos to a 13-3 season, while Brady and the Pats cruised to the AFC East crown with a record of 12-4. In the NFC, the first matchup on the 2014 NFL playoffs schedule pits the New Orleans Saints against the Philadelphia Eagles. The Saints stumbled down the stretch en route to going 11-5 and earning a Wild Card berth. The Eagles escaped Dallas with a 24-22 win over the Cowboys to clinch the NFC East championship in the final game of the season. The final game of Wild Card Weekend features a playoff rematch between the San Francisco 49ers and the Green Bay Packers. The defending NFC champion 49ers are back in the playoffs after going 12-4. The Packers used a miracle finish to beat the Bears and capture the NFC North title on the final day of the season. The 49ers hammered the Packers, 45-31, in last year’s Wild Card round. The top two teams in the NFC entering the 2014 NFL playoffs are the Seattle Seahawks and Carolina Panthers. Seattle is the top-overall seed in the NFC after going 13-3 and winning the NFC West. The Panthers used a late-season surge to finish 12-4 and atop the NFC South. 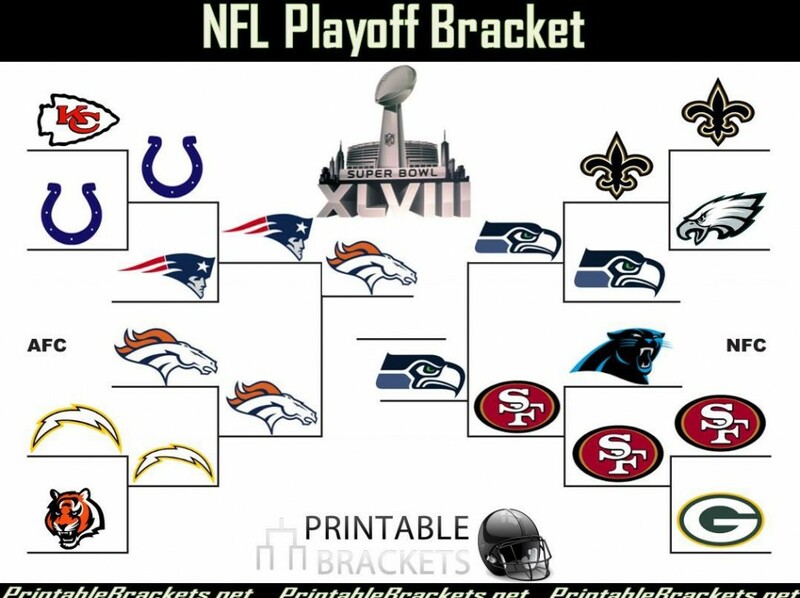 The 2014 NFL playoffs will wrap up with Super Bowl XLVIII on Sunday, February 2nd at MetLife Stadium in New Jersey.